Why Do We Use Confessions, Creeds, and Catechisms? In this ongoing series, we explore the practical and theological distinctives that Blue Ridge Church practices, for the edification of both members and visitors. First, some background. Blue Ridge Church began as a missional church plant in 2012, with the intention of bringing together people in the local area (and as it turns out, far beyond!) who have a strong sense of the sovereign nature of God, the primacy of the Scriptures in our understanding of God and God's will, and as a place where tradition would always take a back seat to biblical faithfulness and love for God and man. Given this context, many people initially expected us to be more of a “seeker-friendly” setting, where everything was ultra-modern and every vestige of historical Christianity had been carefully expunged. This, of course, is not the case. Our goal has never been to do away with historical Christian practice, only to carefully separate that part of it which is biblical and God-honoring and to value it while doing away with unbiblical, entirely man-made traditions. As a Reformed faith congregation, we are solidly rooted in the deeper stream of Christian practice, especially that which flows from the Protestant Reformation and which reflects the deeper truth of Scripture. serve God while pointing us to its origins in God's Word. Catechisms A catechism is like a creed or confession, but is written in a question-and-answer format with the specific goal of instruction. or small groups, to help instruct those who are new to faith and guide them to consider the nature and promises of God. In using these forms, we fulfill God's plan for the New Testament Church. In Paul's letters to Timothy, the Apostle outlines two important things God has given for the ongoing unification, edification, and faithfulness of the Church: leadership by ordinary, well-qualified people approved by the Church, and faithful witness through sound words about Godly doctrine. In these two things rest our understanding of how the Church will continue to fulfill the will of God until the end of the current age. Confessions and creeds limit the power of the local church. First, and perhaps foremost, the Reformers knew that formal confessions of faith limited the ability of the local church to contort or misue the Gospel. By having mutual agreed-upon, widely used confessions as part of our heritage, we ensure that each local congregation of believers affirms those truths that are biblical and which have stood the test of careful biblical scholarship and textual criticism over many generations of study. Without any unifying reference point, it would be easy for local congregations to slip into error through negligence or misunderstanding or worse yet, to be led astray by those who would use a false gospel as a tool for selfish gain. When we verbally affirm together that Jesus “ascended into heaven and sits at the right hand of God the Father Almighty, from whence He shall come to judge the quick and the dead”, we leave no room for anyone to teach that there is another judge of mankind, or that Christ did not ascend to the presence of God the Father in heaven. Confessions, creeds, and catechisms give us a synopsis of Biblical truth. Imagine the position of someone who is seeking to know about God in a congregation that doesn't use any of these forms. What does he do? Read the Bible, certainly—but as we all know, this takes time and dedication. Listen to sermons? Perhaps, but how is someone who perhaps hasn't yet come to faith in Christ nor received the gifts of the Holy Spirit for discernment supposed to know which preachers are reliable? He could read popular books about faith and theology, but that opens the ungrounded seeker or new believer to a minefield of possible misinterpretation, misrepresentation, and outright heresy. In confessions, creeds, and catechisms, we have God's truth in concise form, ready to teach those who desire to learn the essential tenents of Christian faith. No such form can ever fully encapsulate all of Biblical truth, nor do they attempt to, but their value lies in helping those who want a sound basis for reading and understanding the Bible and other resources, as well as being a means for the Church to ground itself perpetually in truth from God's Word. Confessions and creeds provide us with a reference point for assessing those who would serve the Church. The Bible gives us some standards for those who would serve as pastors, elders, and deacons, but how do we judge their faith? At BRC, our understanding is that there are essential (“first tier”) theological issues, and other, “second tier” issues. In the essentials, we must agree to serve God together. 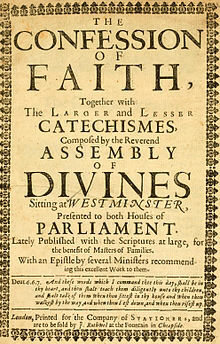 These are the “basics” of faith, and they are contained in such forms as the Westminster Confession of Faith, the Apostle's Creed, the Nicean Creed, and others. Using such forms as a standard by which to evaluate those whom the church would call to serve helps us come together around the essentials of faith, while avoiding needless and destructive arguments over lesser, non-critical issues. Confessions, creeds, and catechisms serve to connect us to the deeper stream of Christian thought across the ages. While every generation must know and serve God in its own context, we are also keenly aware that our understanding of faith, and in fact our very right to practice what we believe, have come to us through the scholarship, struggle, and even martyrdom of many who have gone before us. In expressing our faith in light of these forms held dear by the Reformers themselves, we acknowledge that what we believe to be the evident Biblical truth about God has at times been suppressed and denied, even by the Church, and we have a duty to remember their words. To summarize, these three elements—confessions, creeds, and catechisms—serve to inform and remind both individual believers and the Church as a whole of the core truths about God and God's will. They guard us, individually and corporately, against doctrinal error and heretical teaching, and they connect us to the rich history of those who have sought to rightly understand and practice the will of God as reflected in Holy Scripture. Blue Ridge Church encourages their use in worship, teaching, and personal and family devotions, to the glory of God.